What is Proof of Funds (POF)? Proof of Funds (POF) is a letter or documentation that proves an individual, institution, or corporation has sufficient funds (money) to complete a transaction. A POF is typically issued by a commercial bankCommercial BankA commercial bank is a financial institution that grants loans, accepts deposits, and offers basic financial products like savings accounts and certificates of deposit to individuals and businesses. It makes money primarily by providing different types of loans to customers and earning a spread between what it lends or custody agent to provide confidence or assurance to another party that the individual or entity in question has sufficient funds to complete an agreed upon purchase. The seller of a home or piece of real estate will often request a Proof of Funds from the buyer in order to hold it for them while they wait for the transaction to close. The POF is required because without it there is no certainty that the buyer will be able to complete the transaction. This poses a risk to the seller, as taking the house off the market and then having the deal fall through would be a major setback. 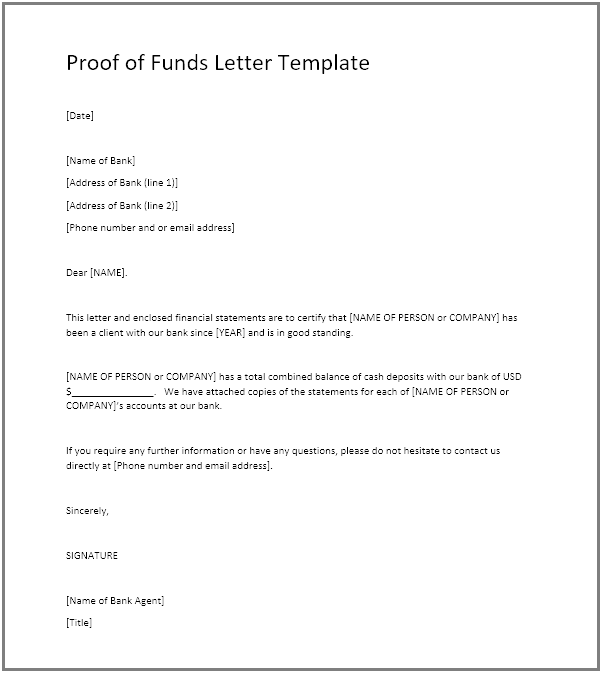 A proof of funds letter may be required from a bank. The letter will be used to verify that the party who claims to have the money actually has it. Below is an example of what a personal bankerPersonal Banker Job DescriptionPersonal bankers offer help in managing and overseeing the financial needs of a client's personal bank account. Personal Banker Job Description details include Aid customers in opening, managing and optimizing their bank accounts and other products, pursue leads and potential customers might write in a Proof of Funds letter. A Proof of Funds letter can be required for immigration into a country. For example, the Government of Canada requires that Canadian Visa applicants show they have enough money to support themselves and their families if they wish to enter under a specific immigration program. The money cannot be borrowed from another person and the money must be able to be drawn for living expenses. Private Equity FundsPrivate Equity FundsPrivate equity funds are pools of capital to be invested in companies that represent an opportunity for a high rate of return. They come with a fixed investment horizon, typically ranging from 4 to 7 years, at which point the PE firm hopes to profitably exit the investment.